BROWARD COUNTY, FL - Broward County&apos;s Port Everglades and its cruise line partners, Carnival Cruise Line and Royal Caribbean International, are working with U.S. Customs and Border Protection (CBP) to launch two pilot programs this summer -- Automated Passport Control (APC) kiosks and Mobile Passport Control (MPC) - that are designed to expedite secure entry into the United States following a cruise vacation. Port Everglades is the first U.S. cruise port to test these programs, although they are currently available in many U.S. airports and for cruise passenger preclearance in Vancouver, British Columbia, Canada. Both programs are designed to streamline the traveler inspection process and enable CBP officers to focus more on the inspection and less on administrative functions. "We are working closely with CBP to improve guest service and make the debark process more efficient without compromising safety and security," said Port Everglades Deputy Port Director Glenn Wiltshire. "We have high hopes for both programs, and are evaluating the efficiency, staff time and costs involved during this three-month pilot program." APC kiosks allow passengers to provide their travel documents and customs declaration forms prior to speaking to a CBP officer. The MPC program is the first Smartphone app authorized to expedite a traveler&apos;s entry process into the United States. This first-of-its-kind app was developed by Airside Mobile and Airports Council International-North America in partnerships with CBP. The app allows U.S. citizens debarking a cruise ship to complete their Customs declaration using their phones, expediting their clearance process in the terminal. "We are very fortunate to be able to partner with Port Everglades in innovative projects that will enhance the arriving passengers&apos; experience. These important business transformation initiatives are part of CBP&apos;s greater resource optimization strategy and will help to support the increased passenger traffic growth that we continue to see in South Florida," said CBP Port Director Jorge Roig. 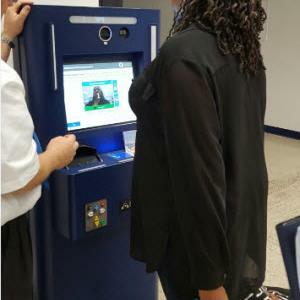 In addition, CBP&apos;s Global Entry program, which gives preferential processing to those guests who are Global Entry card holders, has been available at Port Everglades since summer 2015. Located in the second largest county in Florida, Broward County&apos;s Port Everglades is consistently ranked as one of the three busiest cruise ports in the world with more than 3.7 million passengers in 2015. Nine cruise lines, one ferry and more than 40 cruise ships sail from the South Florida seaport including: Balearia&apos;s Bahamas Express (ferry), Carnival Cruise Line, Celebrity Cruises, Costa Cruises, Cunard Line, Holland America Line, Princess Cruises, Royal Caribbean International, Seabourn and Silversea Cruises. The Port&apos;s wide-ranging fleet of cruise ships provides guests with an array of cruise vacation choices from the sunny Greater Fort Lauderdale, Hollywood and Dania Beach area. View details on the latest cruise offerings at porteverglades.net or contact us by emailing PortEverglades@broward.org.